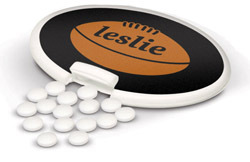 This page contains the mints, chocolates, lollipops and food sold by EPI Promotional Products many of which can be printed. A large print area for maximum advertising exposure. Supplied in a display outer of 50cards. Colours: White, frosted clear, yellow, pink, red, green, purple, blue, black. Sweet tasting high quality 11grm lollipops in fantastic fruit flavours. Logos are printed digitally in full colour on an adhesive label. Imported lollipops in a variety of coloursLollipops that. Colours:(all translucent) - yellow (lemon), orange (orange), red (strawberry), green (apple), blue (blueberry). Note the prices above exclude GST. Printing setup $66.50 full colour. Includes first half hour of artwork. Subsequent extra artwork $75.60 per hour (both excl GST). Repeat prints in the future with no changes are $47.50 full colour. Print size: Digital 30mm full colour. 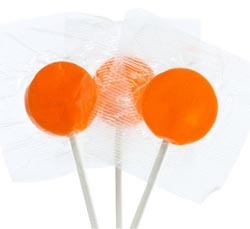 Lollipops that can have the colour specified. You choose!! Plus what is cooler than New Zealand made. Product Colour - Frosted Charcoal, Frosted Blue, Frosted White, Frosted Red. Product Size: 45mm x 58mm. 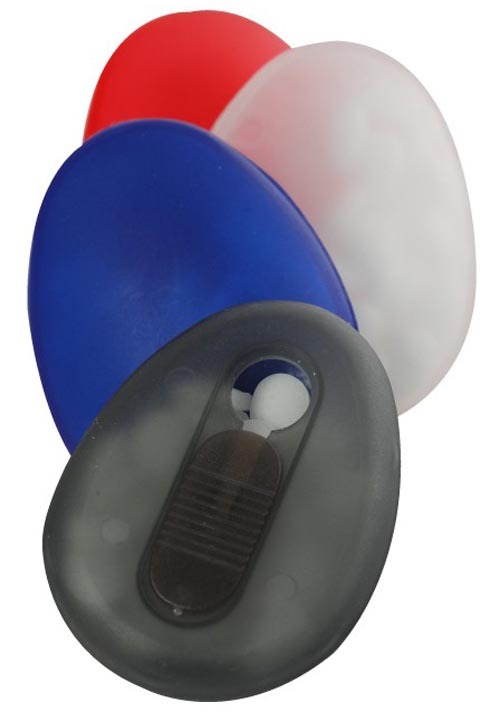 Egg Shaped Mint Dispenser, EPI Code: Core SME. Another delicious advertising idea. 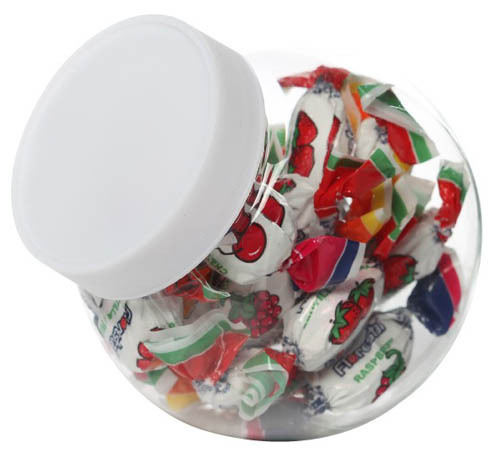 Frosted plastic oval container with 30 mints. Matt silver tin filled with 30gms of quality peppermints. A delicious advertising idea. Stylish flip top tin filled with 30gms of peppermints. Print Area - 30mm circle. Contains 14gms nett. Colours: All translucent except white, red, blue, black. Screw top jar with 14gms of sugar free peppermints. Print area - 48mm x 60mm and to fit house shape. House shaped mint dispenser containing approximately 45 sugar free mints. Ideal for real estate agents, home services and construction industries. Product Size: 75mm x 65mm. Print Area: 50mm x 40mm. 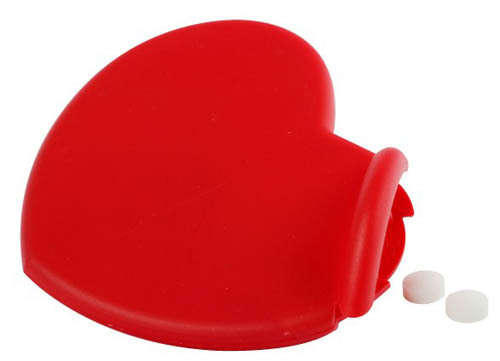 Heart shaped mint dispenser containing approximately 50 mints. Ideal for health professionals, the romance or wedding industries, people who care and love..
Dimensions: W 80mm x L 55mm x 6mm. Dimensions: W 62mm x L 50mm x H 14mm. Colours: Translucent Clear, Translucent Yellow, Translucent Orange, Translucent Red, Translucent Bright Green, Translucent Blue. Dimensions: Dia 20mm x 74mm. Dimensions: W 60 mm x L 105 mm x 10 mm. Branding Options: Full Colour Label: 65mm x 50mm. 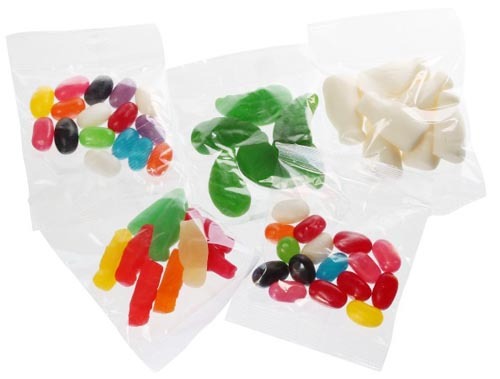 Bag of high quality New Zealand made Fruit Jellies which are GM and gluten free. Contains approximately 30 grams. Dimensions: W 65mm x L 110mm x 10mm. 30 gram bag of delicious mini jelly beans. Dimensions: W 80mm x H 110mm x 10mm. Product Colour - Clear with white lid. Product Size 90mm x 72mm. Print Area: Pad 40mm round, Digital 49mm round. Make your mark in the lunch room or at the front desk. 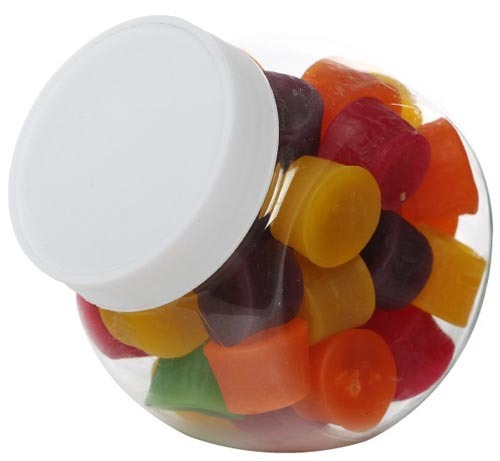 Clear plastic jar with white wrapped lollies and a white lid. Note the prices above exclude GST. Printing setup $66.50 per colour and/or position (or for full colour for digital printing). Includes first half hour of artwork. Subsequent extra artwork $75.60 per hour (both excl GST). Repeat prints in the future with no changes are $47.50 per colour/position (or full colour for digital print option)..
Keep making your mark in the lunch room or at the front desk and keep New Zealand working at the same time. Clear plastic jar with gummies and a white lid. Product Size 100mm x 95mm. Print Area (standard) 50mm x 50mm. Jellybeans for trade show give away to sweeten the day, plus many other days as well. A smaller little bag of Jellybeans for that same special day. 50gm bag of Gummies for trade show give away to sweeten the day, plus many other days as well. 30gm bag of Gummies for trade show give away to sweeten the day, plus many other days as well.